Othala (OTH-ah-la) is a rune which has been getting a whole lot of unwanted attention due to some folks who have chosen to warp its meaning to fit their cause. This will be our starting point for our runic exploration in order to set the record straight. Photo courtesy of Heather G.
Othala has an ancient meaning of ancestral property. It literally references property handed down through continual generations from father to son for upwards of thirty years, which confirmed the property was the uncontested right of the family (1). In modern times, it has taken on the meaning of family and kinship in general. While it continues to represent physical inheritance passed from one generation to the next, it has also evolved to include culture, customs, and status—that which defined a clan but cannot be physically held or easily defined (1). It gives insight into what one holds to be of true importance (3). It also represents the balance between order and chaos, or the world within the home and the world without (1). It can offer insight into order within a group, or order within the self (3). This rune was misappropriated by the Nazis of the past and continues to be used today by the newest wave of Nazi adherents. Those who consider the rune to represent physical blood inheritance are looking at only a portion of the picture, and ignoring the cultural and spiritual aspects of it. Does one need to be blood-related to the Greeks to be called by Athena? Must one hold Celtic roots to be special to The Morrigan? Lineage is just one way to adopt a tradition, and Othala has been understood by runic scholars to incorporate not just the physical but the cultural and spiritual as well. In viewing the spiritual, we also need to incorporate our non-human brethren, which lends an animist flair to this rune (1). 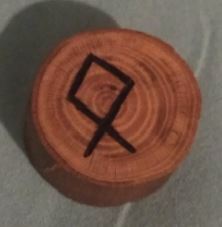 When doing a casting, one may view this rune’s meaning as family—whether kin or kith, a community, or a relationship to the land. It could also signify a connection with one’s ancestors, physical or spiritual (1). If the rune appears merkstave (reverse), it hints at a lack of order, totalitarianism, and/or poverty (3) with no help from the outside to come, or a situation in which money will be of no help (2). In this position, it also signifies what it has been co-opted to mean: prejudice and clannishness (3). In all castings, the runes with which Othala appears will influence its specific meaning. For example, when shown with Fehu, it takes on materialistic meaning but with Mannaz, looks at a more spiritual one (2). Likewise, with Ansuz, it could begin or restart spiritual discovery (1). By inscribing this rune within doorways of your home, whether in smoke or via physical carving, one protects their property and their family within, keeping order between the four walls and creating a barrier to keep chaos out.